The Day of the Dead (Dia de los Muertos) is a Mexican celebration of pre-Hispanic origin that remember friends and family members who have died.We have represent this celebration in our Mexican Talavera Tiles with motives of the Day of the Dead in high relief. People visit the cemetery where their loved ones are buried. They decorate gravesites with marigold flowers and candles. They bring toys for dead children and bottles of tequila to adults. They sit on picnic blankets next to gravesites and eat the favorite food of their loved ones.The skulls were used to symbolize death and rebirth. 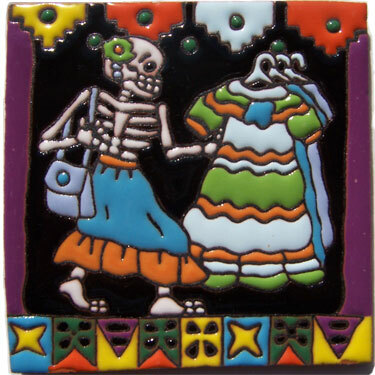 With these beautiful Mexican Talavera Day of the Dead Tiles, you can decorate any space in your house, these typical Mexican Talavera Day of the Dead Tiles will make your kitchen, backsplash, countertop, look gorgeous, giving a special touch that only Mexican Talavera Day of the Dead Tiles can give.